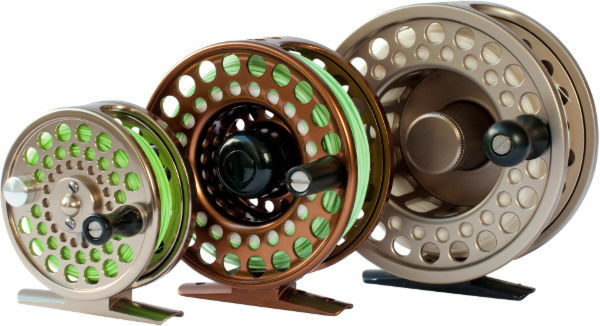 Redington manufactures high-grade entry-level, mid-range and professional fly fishing reels and rods. On most rivers, streams, and lakes, there are high chances that anglers had their first fishing experience using a Redington reel or rod. Thousands are still happily fishing with gear from the Mighty Redington. The Redington VICE Fly Fishing Outfit – Fly Rod & Reel Combo is designed to offer an exclusively great experience to beginners and intermediate fishing combo. Pros too will be appreciative of its performance when it lands in their hands. Not long ago, the Loop Evotec Series Fly Fishing Reels were redesigned and updated from the previous design. The spawning after revamping saw anglers feel a fly reel that brags of all the powerful features that the Opti series reels had. If you have come across the Loop Evotec G4 Featherweight Fly Reel, then you know that the changes were for a good course. The reel carries a Power Matrix drag System just like the Classic and Opti Series. Loop is one of the reputable companies that the fly fishing industry gives credit to for the endless desire to innovate and manufacture high-quality fly fishing equipment. Although most of the products are priced higher, they deserve it. Not crap at all! You definitely want value for each buck spent. So? Invest in high-quality reels and rods that will be by you each time you need to take on a trip. Back to the mighty reel. Beneath the reel’s stunning looks is the ultra-modern unshakeable Power Matrix Drag System. It is a monstrous braking system that can subdue the strongest species of fish in some of the harshest conditions you cannot imagine. It is completely waterproof and benefits from the pronounced click which clearly signals-fish on. The Evotec is totally corrosion resistant despite the environment it is exposed to. With swirling gusts, pelting rains, uncontrollable cold and pushes of angry steelhead, many rivers, lakes and oceans in winter make a great test environment for sampling and testing wading jackets for the feminine gender. There is something about the Orvis Women’s Pro Jacket and the Patagonia Women’s River Salt Wading Jacket that will leave you in awe. Every aspect of these jackets from the fabric construction, cuff designs to the pockets and storm hoods, they all get a workout. We have rounded up a few best wading jackets that comprise both male and female designs on the buyer’s guide on our website. You can pass by and see how enticing everything is. We only pick the best of the best. Since its establishment in 1973, Ross Reels has been a top producer of high-quality reels. Decades down the line, it is still a household name. Even though the company has seen changes in its management, the production process has greatly improved with the advancement in technology. The company has stuck to its values, among them, customer satisfaction. This is evident in the Ross Animas Fly Reel. Standing by the tag, ‘’Made on Water’’, the company’s dedication to innovation and quality is something every user of their product will attest to. Before the Ross Reels are released for sale, they undergo rigorous tests to ensure performance and durability are long-lasting. Designed and made in the US, the Animas Series is set as an all-round fly reel that you can move with to anywhere. This is with regards to the environment. Ross Reels had a saltwater, freshwater and warm water setting in mind during its workmanship. How do you find this? Economical in all ways, right? While you could have three separate fly reels for every environment, you can have a three in one. Its excellence is undoubtable. It has all the capabilities of providing high versatility and high speed. Leave for the solid aluminum frame, its anodized finish is everything you need to take your hat off. You might wait for it to be ineffective for ages with no success. The finish protects the fly reel against the agents of rust and corrosion. No worries when fishing in some of the brackish fishing environs. Two giants in the fly fishing industry are working effortlessly to see that anglers are loving adventure and fun in the natural world. Orvis and Redington are doing exceptionally well in the manufacturing and supply of high-quality fly fishing gear, equipment and apparel. Just like what is in this Redington Crosswater Combo vs. Orvis Encounter Fly Combo comparison. Redington has been in existence since 1992 while Orvis has hit a century and over since it was founded in 1856. Both companies pride themselves in customer service and satisfaction. Moonshine Rod Company manufactures a wide range of fly fishing rods that suit any angler. Among them is the Moonshine Rod Company The Drifter Series Fly Fishing Rod. Fly fishers who have had hands on any product by this manufacturer can confirm that they have good price points on all products to suit any budget. The company is a new one but is doing better than some legends. All fly rods are backed with a lifetime warranty in case of any repairs and replacements of rods with defects. All terms and conditions have to be followed to get service. Thrashing by brushes and stabs from flies can make your wading jacket almost non-function. Maybe patching and piecing back together can make you wear it once more. But for how long? A solution to the fears of abrasion. The Patagonia Tough Puff Hoody Wading Jacket is what we are talking about here. Patagonia is a household name when it comes to manufacturing fly fishing wear that is durable, functional and affordable. The conditions that anglers face put them at high risks of falling ill. Adverse weather conditions are uncontrollable but when in the right gear, there is no need to worry. The Tough Puff is a modified version of Patagonia Nano Air- still one of the puff families. After being released into the market, the Nano Air earned very highly in the breathability and comfort metrics. This was because of the soft yet stretchy fabric and the FullRange insulation. From afar, the two jackets almost look similar but from close range you spot the differences between the two. Many anglers love the heft of a classic rod and the Redington VICE Fly Fishing Rod is your ultimate choice of a stick. Redington offers all the proportions a caster will love in this type of rod. Satisfaction from its use is derived from the performance characteristics and modern materials used in craftsmanship. Redington is an acclaimed manufacturer of fly fishing gear, equipment, and apparel. The company puts great focus on design and production to make spending longer hours on water more fun. The VICE has some of the advanced features that you will not spot in many rods. Its blank is made from multi-modulus carbon fiber with fast action. The recovery levels are to the best levels and accuracy and control are a surety. Both amateurs and veterans can count on it. Unlike medium or slow action rods, you can throw some of the tightest loops, make the longest casts of time and work perfectly with heavier flies even in windy conditions. Redington never gambles with durability and quality. Deeper into aspects that ensure you spend on the best of the best, the components are undeniably reliable. They are of saltwater grade meaning they are resistant to corrosion and rust when exposed to the harsh environs like saline waters. Quite a fantastic option for rookie saltwater anglers or fly fishers who are visiting saltwater regions for the first time. The components add to the rod’s durability. It doesn’t matter if you are in pursuit of cutthroats or bonefish, it has your back. (Euro/Czech Nymph Style) Czech nymphing is not like your usual nymphing style. Its roots are in Eastern and the Middle parts of Europe. Some of the best Czech competitors took this style as part of an experiment and perfected it to what it is now. There are special rods like the Moonshine Rod Co. The Epiphany Series (Euro/Czech Nymph Style) Fly Fishing Rod for this style. The principle of Euro/ Czech nymphing is fishing in short distances done under the fly rod’s tip. The line hangs beneath the rod’s tip and most of the time; the end doesn’t touch the water. You can use two to three nymph flies of different weights. Czech nymphs are normally weighted flies you tie on grub style hooks. They imitate freshwater shrimps or the case-less larvae of the caddis flies. Patterns used are super flashy are between size 8 and 16. They make the body from synthetic or natural dubbing. Their backs are made from high-grade latex strips or any other material that has the same characteristics as latex. Colored wire or monofilament is used for ribbing. Real Czech nymphs are tied very thinly for them to sink quickly. Patagonia doesn’t need an introduction anymore. It is among the reputable and top-rated manufacturers of fly fishing gear, equipment and apparel. The zeal and dedication to improving how outdoor gear is designed and manufactured gives them a legendary crown. Their expertise can be seen in the Patagonia Tough Puff Hoody Women’s Jacket. If you haven’t spotted a few on streams, rivers and the coast, you aren’t fly fishing with the avid anglers. Puff jackets are becoming common these days and terming them as ubiquitous won’t cut it that much. They have earned prevalence. Puff jackets from Patagonia Womens range provide warmth, protection from weather elements and are packable. Any angler needs such a workhorse when getting on the water. The Tough Puff comes as an all-purpose and intent jacket. It is an upgrade of the Nano Air which is another that had a great reception after its release into the market. Taking a rather new and advanced Tough Puff Insulation technology, all the jacket’s strong points are dependent on it. This allows the jacket to do some things that others in its category or higher can’t. Patagonia Women’s River Salt Wading Jacket Review – Style as you Fly! Are you a woman passionate about fly fishing? Nowadays you don’t have the obvious lame excuse of ugly male wading jackets that you may be forced to wear. Currently, more ladies are taking part in fly fishing and manufacturers and suppliers of wading gear and apparel are taking note. It is true that a man’s body isn’t built the same as a lady’s. There are many differences and they could be what keep one from feeling comfortable when in fishing apparel. For instance, there are major differences between the Patagonia Women’s River Salt Wading Jacket and the Patagonia Men’s River Salt Wading Jacket. Same manufacturer, different designs but same functionality and performance. There are several renowned manufacturers offering the best quality wading jackets specifically cut and designed to suit a woman’s shape. Wading jackets for women come in different sizes, styles and colors. You know how sensitive women are on matters fashion anywhere. It is undeniable that women include a degree of aesthetics. Cortland is a famous name among anglers because of its durable fly fishing gear and products. This company has been in this business since 1915 and seems to be growing stronger and bigger each year. What drives them into remaining focused is experience and passion. They develop the most advanced fly lines you can find in the market. All fly lines from Cortland including the Cortland Precision 15 Ghost Tip Fly Line have been designed using the latest technology. Cortland developed the technologies to ensure fly lines are high performing, durable and exceed the user’s expectations. Precision 15 comes in different sizes ranging from size 5 to size 9. You can choose your size and feel free to experiment with other sizes. If you live in an area with salty water, this Ghost Tip fly line is the ideal choice. It never fails in its floating function as a sub-surface fly line. Anything Orvis is a guaranteed product. Being in this sports and recreation industry as a manufacturer for many years now, they have been able to showcase professionalism and reliability in the products they create. In the list of pacesetters, Orvis remains at the top and its reputation will remain solid as long as consumer satisfaction remains their priority like before. This jacket was a winner of the 2017 IFTD Best of Show Award – Women’s Outerwear so rest assured its features are good. This Orvis Women’s Pro Jacket is the ultimate protection solution for all female anglers. Its three-layer construction is an assurance of warmth regardless of the weather. The fact that the jacket incorporates weaving means that breathability was a consideration during designing. You will remain fresh throughout your fishing sessions because of the free air circulation. Women love their hair and that is why the adjustable hood comes in handy. It is big enough to accommodate any hairstyle of your choice. Spacious pockets are in different positions and you can store in your valuables and fly boxes. Simms offers a wide collection of fly fishing gear well designed to meet every angler’s needs. From pants to waders to convertibles, all are of high quality. With women not having so much to choose from, Simms had their needs in mind and designed the Women’s Guide Wading Jacket. For a reason, the company doesn’t recognize the existence of bad weather. That is why all apparent, gear and equipment are well-built with this philosophy in mind. All your problems will fade away the moment your fly line hits the water. However, the raging storm around you will persist. The Women’s Guide jacket protects you like a pro. For years now this company has been an award-winning company and still is. Simms claimed five awards in the ICAST New Product Showcase in 1998 and has been winning them since. In 2016, the company was awarded the president’s E award to recognize Simms export business. The company serves anglers all over the world and guides and guillies take Simms products as there go to fly fishing wear time and time again. You can never expect substandard products from Simms. Craftsmanship, field tests, and quality control are part and parcel of vital procedures that products undergo before releasing into the market. You know that Orvis minds your health when it launches excellent fly fishing wear like the Orvis pro wading jacket. Orvis is the world leader in fly fishing and has an assortment of both men and women’s wear that are professionally designed and made to suit protect you from the weather extremities when wading or angling. The jacket in this review is made from high-quality material that is breathable yet well insulated to keep you warm and dry at all times. The triple layer fabric design on the outer shell beats mighty storms and winds. Your fly boxes will have dry and spacious pockets to be stored in. the waterproofness capabilities are high and no matter how deep you wade, you are guaranteed dryness and comfort. Attachment points on this jacket allow you to hook your nets, zingers and other items on the D-ring that is on the rear side of the jacket. If you have many fine fly fishing rods in the past, you will persuade others to spend their hard earned bucks on high-quality fishing gear, equipment, and accessories. It is certainly is the right way to go and Sage Fly Fishing Company should be among your crème choices. Sage has been in the fly fishing industry since 1980 and without a doubt is scaling higher in building some of the world’s finest and high performing fly rods. Thanks to the use of world-class material, great innovations evident in the Sage Bolt Series Fly Fishing Rod and many years of experience. The many reviews from satisfied users show that Sage has revolutionized the fly fishing world. Once you have treated yourself to this bright and beautiful Sage Bolt, you can confirm that by no means is it a cheap rod. The blank uses the Generation 5 Technology which has by far been better than the Konnetic used the previous series. This rod is designed for anglers who are passionate about every cast they make. In the hand, it feels stiff and handles the fly line perfectly. Even to greater lengths, it allows a fly fisher to hold great lengths of the line in the air. It holds a tight loop when throwing the line and is less forgiving. An intermediate or advanced caster will love it to bits. Scott Radian R 905/4 Fly Rod Review – Fast and Feel come together! 45 years of craftsmanship and ambition to perfect designs and performance of fly rods, Scott Fly Rods has marked a difference in the fly fishing industry. A true and beautiful combination can be depicted from the mix of feel and fast action taper in the Scott Radian R 905/4 Fly Rod. Technological advancements during manufacture are responsible for the exemplary performance through increased recovery speed by highly reducing wobbling and creating fast action resulting in a great presentation. Having a flexible rod is the beginning of winning on the water. You can make delicate casts with some of the finest leaders. It mends extremely well and the tip is very flexible. The rod will change your impression towards Scott Fly rod. As a well-rounded rod and a Jack of all trades. For all distances, whether long or short it traps every angler to liking it. It is smooth and fun to cast and if you find more interest in casting for distance, you will love it. As you use the rod, you will notice that every corner is intact no short-changes. The aesthetics are on point and at the first sight, having such a striking rod may make one skeptical of its performance. Un-sanded graphite with subtle orange wraps is undeniably epic. The feel is crisp and for in close fishing, it is the perfect rod. Especially with nymphs and dry flies. It is solid at mid-distance with high accuracy levels. As it approaches a longer distance it maintains its track well and generally the reserve power is great. Any angler buying a fly rod has trust and hope that it supersedes their expectation. This one wins a shout out here. While you will need to get used to the Wells grip, this is not your standard grip or cigar grip. At the thumb where the grip sits will be a little steep for new users. The advantage is a reduction in fatigue after lots of hours of throwing at a longer distance. However, if you are used to Full Wells corks, it fits very well in the hand. You might find blame in the inch marks which aren’t as high as expected but if you are an angler who catches small and medium-size ones, it shouldn’t be a bother. The backbone at greater lengths is excellent and performance remains consistent throughout.